Please note: I've rewritten this post, whith pictures of the process! For the new version, go here. I have been solo with my children for the past four days. (Ah, deer season.) Overall it has been magical, fun, and smooth as can be. We hit our rhythm right off the bat and kept our stride until yesterday morning. We've been thrifting, hanging with some of our favorite friends, dipping candles, making caramel corn, and playing so many games. But somehow "Papa-is-coming-home-today" Day is always the sticky one. We all fall apart. With Lupine not napping much these days and me falling asleep with the kids at 8:30 the night before (oops), I was wanting just a moment to myself. 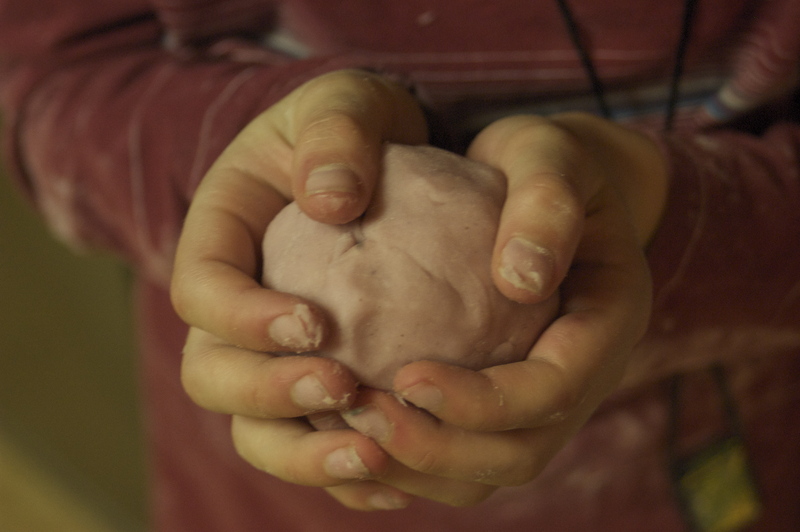 Enter Play Dough. My sanity. I don't know the origin of this recipe except that my mom gave it to me when Sage was two and I have shared it with countless families, much to everyone's delight. It makes great DIY holiday gifts too, with just the dry ingredients in a mason jar along with the recipe. A fabulous, earth-friendly, homemade kid-to-kid gift. Combine dry ingredients in a medium cooking pot. Add wet ingredients (except essential oils) and stir. Cook over medium heat stirring constantly. It will soon turn into a gloppy, lumpy, ugly mess and you will be certain that it isn't working… but it is. When the dough forms a ball in the center of the pot turn out onto a lightly floured surface and knead (let it cool a bit if your kids can wait). Make a thumbprint in the center and add a couple of drops of essential oils and knead in thoroughly. Store in the fridge. Discard when it becomes sticky (usually two months or so around here). We sometimes like to do several colors at once. To do this, leave the batch uncolored and tint when completed. To do so, make a thumbprint in each finished dough ball and add a drop of coloring. Ever so carefully knead it in with the dough in your hands (not on the counter as your drop of color may attempt to escape). Children learn what they live. We were without Hunter Daddy this week, too. I think you’re the only other like-minded kindred sister who also has a hunting component to their family culture. How wonderful to be reminded that we’re not the only ones!!! Isnt it fun, straddling the cultural divide? Next deer season I call a crafty-mama weekend. Are you in?